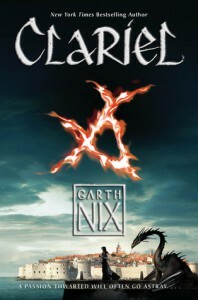 Set within the same world as Garth Nix’s OLD KINGDOM trilogy, CLARIEL tells the story of a seventeen-year-old girl whose family moves from Estwael and the Great Forest to the capital of The Old Kingdom, Belisaere. Clariel is not happy with the move to help further her mother’s career, and longs to return home but events within Belisaere are coming to a head, and Clariel finds herself caught up in them. I fell in love with Garth Nix’s OLD KINGDOM trilogy when I read SABRIEL, so when I heard that Nix was returning to that world in a new book I was really excited to get my hands on a copy. As CLARIEL is a prequel to the series, the world is at once both familiar and eerily different – you can see first hand some of the sights/ideas hinted at in the trilogy, and it is at once both brilliant and slightly depressing. CLARIEL follows Clariel as she learns to navigate the new city, and the new politics. I had a difficult time liking or empathising with Clariel because she was a very passive character for most of the book and just let events happen to her. As such I found the first three quarters of the book to be quite boring, although I was intrigued by the events of the prologue. The final quarter of CLARIEL was everything I expected from a book set in the Old Kingdom, and was Nix at his best. There was a lot of action, and twists and turns in the plot and I just could not put the book down – I had to know what was going to happen next. Nix did a good job of resolving the story, although he did leave a final revelation to his note at the end as to how CLARIEL ties into the OLD KINGDOM canon. One of the things that I did quite like about CLARIEL was actually seeing some of the decay hinted at in SABRIEL. I also quite liked some of the secondary characters, particularly Roban and Belatiel. Then there was the return of Mogget, one of my favourite characters in the trilogy – it was really nice to see him again. Overall I think CLARIEL is an interesting addition to the OLD KINGDOM canon, and if you are a fan of the series then you should definitely check it out.